In the mountains of Vaucluse and facing the Luberon, this modern property benefits from three main buildings and outbuildings, with breathtaking views over the Luberon and its valley.The main building includes: a large living room of more than 140 sqm, with fireplace, divided into lounges, an office, a billiard room, a dining room, a semi open plan fitted kitchen and living room, with a scullery and a cellar in the basement. To the West of the lounge, a master bedroom with its bathroom and its dressing room, a sauna and a toilet. A kids bedroom with a wardrobe.The guest house 1 comprises: 2 bedrooms, 2 bathrooms, 2 toilets and a canopy.The guest house 2 includes on the ground floor: a home cinema, a toilet, a large hall with a sink. Upstairs, a large bedroom, bathroom and terrace, and another bedroom.Outbuildings: a pool house with a kitchen area opening onto the pool, a technical room, 1 bedroom with a shower room and a toilet.The property also benefits from a large garage.Heated swimming pool of 6 x 12 meters. 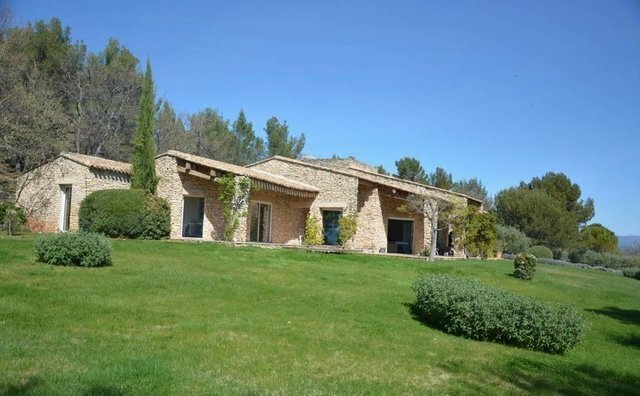 Plot of land of more than 2 hectares enjoying panoramic views over the Luberon and its valley. The vegetation is composed of white oak trees, olive trees one of which being 100 years old, lavender and vines.The property benefits from modern comfort: large bay windows to the south with electric shutters, underfloor heating system, heated towel rails in the bathrooms, automatic watering system and automatic gate ...Due to its situation and its services, this is a property that would suit perfectly a large family, and the plurality of buildings would also allow the possibility of running a rental activity (cottages or gites). A must see.